PT Bank Rakyat Indonesia (Persero) Tbk - Bank BRI (IDX : BBRI) is a leading Indonesian state-owned banking company headquartered in Jakarta. Bank BRI has strong business focus on serving and empowering micro, small, and medium enterprises (MSME’s) segment. As a state-owned bank, Bank BRI is controlled by the Government of Indonesia. At present, Bank BRI is 56.75% owned by the Government of Indonesia and 43.25% by general public and investors. 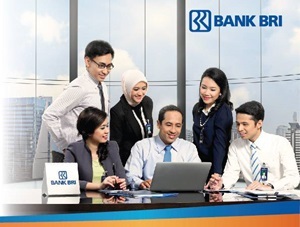 The Bank's operations are divided into 19 regions throughout Indonesia. As of December 2016, Bank BRI offer services through 1 special branch office, 466 branch offices, 609 sub branch offices, 5,380 BRI Units, 984 cash offices, 2,545 Teras BRI units, and 638 Teras Mobile Units and 24,292 ATMs, served by 93,333 employees. Bank BRI has 5 subsidiaries; PT Bank BRISyariah (BRISyariah), PT Bank Rakyat Indonesia Agroniaga Tbk (BRI AGRO), BRI Remittance Company Ltd, PT Asuransi Jiwa Bringin Jiwa Sejahtera and PT BRI Multifinance Indonesia. According to PT Bank Rakyat Indonesia (Persero) Tbk Q2 - 2017 Financial Update Presentation as cited by JobsCDC.com, Bank BRI managed to recorded good performance in the first semester of 2017 (1H 2017, ended in 30 June 2017). Bank BRI reported total assets of Rp1,027.33 billion in 1H 2017. This number is up 13.2% year on year (yoy) from Rp907.84 billion in the same period previous year (1H 2016). Total net profit until June 2017 amounted to Rp13,448 billion, increase 10.4% from the achievement of the year 2016 (1H 2016) by Rp12,182 billion. Minimum Diploma (D3) holder (accredited). Computer literate (Microsoft Word and Microsoft Excel). Good looking (latest color photograph size 4x6 and 3R). Well-behaved as evidenced by SKCK from POLRI. JobsCDC.com now available on android device. Download now on Google Play here. Please be aware of recruitment fraud. The entire stage of this selection process is free of charge. 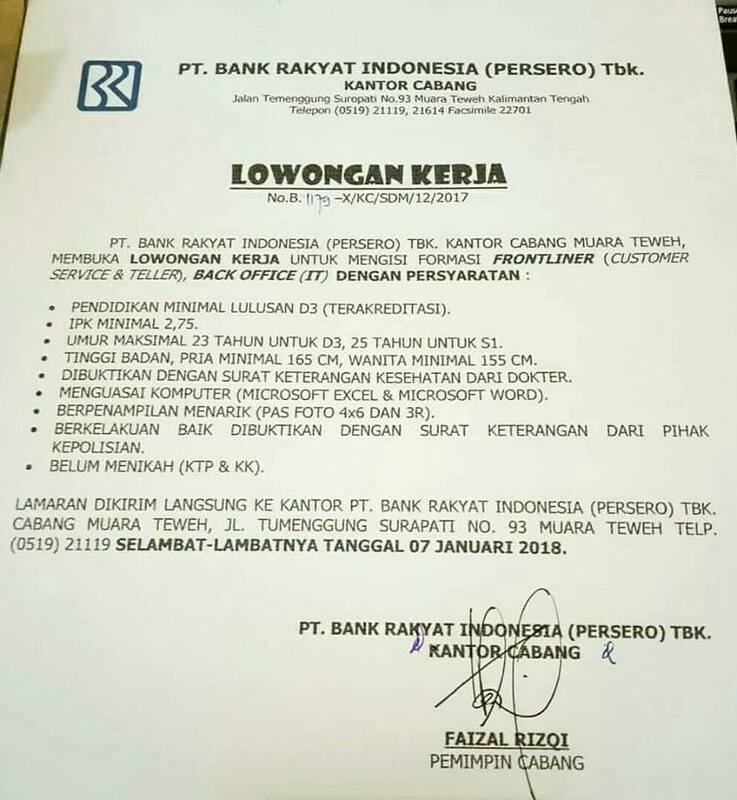 PT Bank Rakyat Indonesia (Persero) Tbk - D3, S1 Frontliner, Back Office BRI December 2017 will never ask for fees or upfront payments for any purposes during the recruitment process such as transportation and accommodation.